Manchester is to play host to yet another world premiere – a new musical based on the songs of 60s band The Monkees will launch in the city, I can reveal. The new show, called Monkee Business, will follow the format of other successful 'jukebox' musicals in using the songs of the band weaved around a new story. Similar shows, including Queen musical We Will Rock You and Abba show Mamma Mia, have gone on to huge success across the globe. Now, producers are hoping that The Monkees' hit songs like I'm A Believer, Last Train to Clarksville and Daydream Believer will make the new show as big a hit. Monkee Business will premiere at the Opera House next March as part of Manchester Gets It First, a campaign to make Manchester the UK's official theatre launch city which has won the backing of the city council. Ghost the Musical was the first MGIF show, with almost 100,000 tickets sold during its seven-week run earlier in the year. The show itself is billed as a flamboyant 60s-themed adventure following four normal young lads who get mixed up in a madcap adventure that Austin Powers would be proud of. Made instant world-wide stars by the famous 1960s TV series, The Monkees, made up of Manchester’s Davy Jones, Micky Dolenz, Peter Tork and Michael Nesmith, became one of most successful bands of their generation – at one time even outselling the Beatles and the Rolling Stones - releasing 121 songs on nine albums and influencing many future artists. The band have not been directly involved in the concept, but producers hope they will attend the premiere. Howard Panter, Ambassador Theatre Group’s creative director, said: “Following the incredible success of the world premiere of Ghost the Musical at the Opera House earlier in the year, we’re delighted to be premiering yet another landmark new musical, Monkee Business, as part of our Manchester Gets It First campaign. Welcoming the news, councillor Mike Amesbury, executive member for culture and leisure at Manchester Council, said: “These are exciting times for Manchester, and this is yet another world first which has come to Manchester before going to London's West End or Broadway. 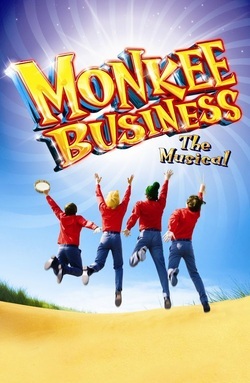 Monkee Business the Musical will play at the Opera House from March 29 to April 14, 2012. Tickets go on sale tomorrow on 0844 871 3018.